So what is emotional energy? Emotional energy is our inner fuel. It’s what gets us out of bed each day to take part in the world. When we acknowledge and express our needs, we add fuel to our emotional energy tank. This is the energy in our thoughts, our words, our feelings, the kind that manifests as hope, resilience, passion, fun, and enthusiasm for life. When we feel we are not being heard, or our ideas and opinions, it diminishes our sense of well being. When we learn to tap into our feelings, we identify what we need to move forward. As we make our needs a priority we increase our sense of well being. When you constantly feel tired or blah then your emotional energy is likely to be low. So it’s time to evaluate how you really feel. 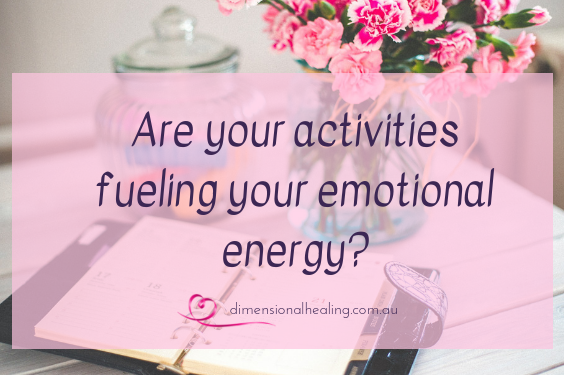 Assessing your energy is a quick simple process but it does take practice for you to read the energy and work through what it means for you. Do a scan of your body each morning so you are aware of your own aches and pains, emotions, wants and needs. Become aware of what emotional changes take place throughout the day and where they come from. What drains you and what lifts you up. Learn to tune into your vibration to raise your emotional energy. Do you need help in deleting that stuck feeling so that you feel more vibrant then check here to see how I can help you!